Set to expand potfolio, to launch milkshakes and flavoured milk. Parag Milk Foods, the maker of Gowardhan brand of milk, curd, ghee and cheese, will soon make a foray into milkshakes segment as well. “We will launch milkshakes in the next three to four months. 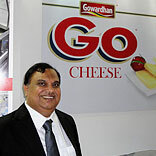 The research and development is still going on,” said Devendra Shah, Chairman, Parag Milk Foods. The company is also expecting a 4growth of over 35 per cent this fiscal. “We clocked revenues of Rs 875 crore in FY 2012. We are expecting it to move up to around Rs 1,200 crore this fiscal,” he said. He said that the company is also increasing its distribution network and should be present in 100 towns soon. “We plan to expand more into the Eastern and Northern markets. We have plans to open 150 exclusive stores in big cities by next January. The new stores will be on a franchise model,” Shah added. The company has invested close to Rs 110 crore for a plant in Andhra Pradesh, which has ultra heat treatment (UHT) technology. “Our new plant in Andhra with the UHT technology has been commissioned and has a capacity of seven to eight lakh litres per day. It is basically for tetra pack products. “This year, we have invested Rs 40 crore for this. Besides, we have invested Rs 70 crore in the plant for infrastructure,” he said. This is the first time that the company will be launching tetra pack products. The firm, which also has a plant at Manchar near Pune, aims to capture a volume share of 10 per cent in the 11 lakh litre a day market within the next three months. The dairy company also plans to launch flavoured milk using the UHT technology.